The Braille Sense U2 from HIMS, in addition to being the fastest and most advanced Braille Notetaker available, is uniquely designed for Deaf-Blind Users as a complete communication package. 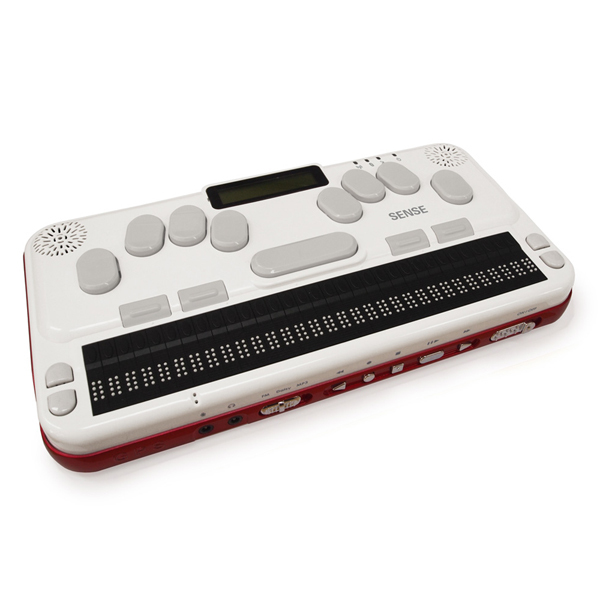 Our Braille Sense U2 has built-in Wi-Fi and Bluetooth for email and internet connectivity. With its GoogleTalk and MSN Messenger applications, you can chat with your friends and family, anywhere, anytime. With a built-in vibration motor, the Deaf-Blind user is alerted to messages, prompts, incoming chats, and alarms in a way that is accessible without hearing or sight. Connect the Braille Sense U2 to your PC, MAC or Smartphone and gain intuitive Braille access using a variety of screen readers across multiple platforms. Use the Braille Sense U2 to ergonomically and efficiently type text messages, read emails, navigate web pages via your device’s web browser and access your appointments. Braille Sense U2 operates as a Braille display via Bluetooth with iOS devices providing Braille keyboard input and Braille output for your iPhone or iPad. Use the Terminal Clipboard on the Braille Sense U2 to comfortably edit text on the notetaker before sending to the I-device as well as to copy and paste text from other programs on the notetaker to the iPhone or iPad. Use our upcoming iPhone communicator application to easily establish a Bluetooth connection between your Braille Sense U2 and iPhone and use the combination as a Face to Face Deaf-Blind Communicator. - Boasting a 1GHz Mobile CPU and a 32GB flashdisk, Braille Sense U2 offers rapid data processing combined with as much memory as you desire. - Create and read documents in any of five languages and use multiple bilingual dictionaries to ensure accuracy and style. Highlight your most important points with advanced font and style options. Always have complete and up-to-date access to your email with IMAP access, and open EML files directly from the File manager. Secure your valuable information with file encryption. - In addition to the bilingual features and Sense Dictionary for language practice and learning, Braille Sense U2 offers fraction calculation and Nemeth Braille code entry into a fully functional scientific calculator. Our unique built-in LCD allows sighted teachers and parents to view a student’s progress while he uses Braille Sense U2. - Enjoy a clear and powerful stereo audio listening experience with easily accessible audio buttons and 11 equalizer settings. In addition, easily and instantly control FM Radio, DAISY Player and Media Player with designated media buttons located on the front of the unit. - HIMS’ unique, flipable LCD display has facilitated easy and natural communication with the deaf-blind for several years. Now with an added vibrate Motor, a deaf-blind person can be alerted to receive messages or errors in input or navigation. - Stay connected to your friends, family and the world via Ethernet, Wi-Fi (b/g/n) or 3G USB modem. - Take advantage of our mobile connectivity and click on Twitter to instantly access the world of social networking. Chat with your classmates, co-workers, family and friends using Google Talk anytime, anywhere. - Improved GPS receiver and electronic compass allow you to explore your surroundings and provide instant, accurate directions or real-time, turn-by-turn navigation to your destination. GPS map data is an optional add-on. * Weight: 924g / 2 lbs.